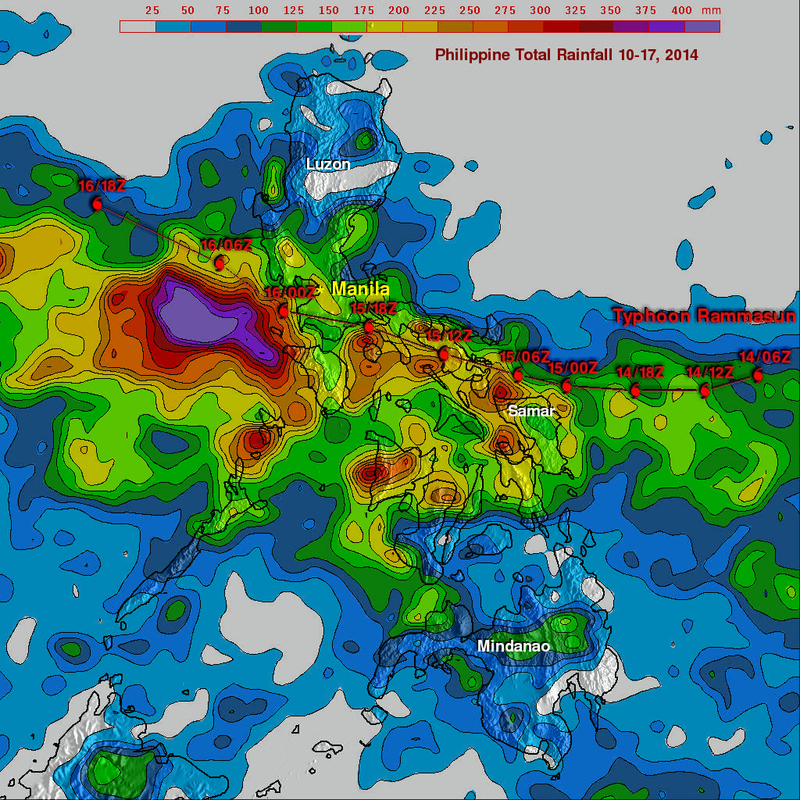 Typhoon Rammasun first tore across the Philippines earlier this week, dumping up to 13 inches of rain in some spots and causing the deaths of at least 40 people. It then emerged over the South China Sea and underwent a rapid re-intensification that boosted it to Super Typhoon status before it hit China’s Hainan Island, becoming the most intense typhoon to hit southern China since 1973, according to the World Meteorological Organization. Warm ocean waters and a favorable atmospheric environment allowed Rammasun to quickly regroup after its foray over the Philippines left it weakened and somewhat disorganized. While such rapid intensification has been seen many times in tropical cyclones (the blanket term for typhoons and hurricanes), the dynamics of the process aren’t well understood, limiting forecasting abilities. “Tropical cyclones (known regionally as typhoons) are a bit like snowflakes; no two are alike. Predicting how their intensity will change is notoriously difficult,” said Kerry Emanuel, a MIT meteorologist and climate researcher who has extensively studied the effects of climate change on hurricanes. Rammasun began as a Tropical Depression on July 10, strengthened into a tropical storm by the following day and then after traveling over some of the warmest ocean waters on the planet, it ramped up to a full-blown typhoon by the time it made landfall over the Philippines on July 15. The warming of ocean waters due to the buildup of greenhouse gases in the atmosphere is a concern for the future threat of tropical cyclones, though exactly how climate change will affect the frequency and intensity of storms is an active area of research. Some studies, including some cited in the most recent Intergovernmental Panel on Climate Change report, have suggested that storm intensity will increase, but frequency will decline, while others have suggested that both will rise along with warming. The waters around the Philippines are also some of the fastest warming, as the ocean takes up much of the excess heat from the atmosphere trapped by the rise of carbon dioxide and other greenhouse gases. The sea level rise in the region contributed to the catastrophic storm surge of Super Typhoon Haiyan last fall when it hit some of the same parts of the Philippines that were recently racked by Rammasun. Haiyan, known in the Philippines as Yolanda, reached a strength equivalent to a Category 5 hurricane and was potentially the most intense storm ever recorded at landfall. Estimates of storm surge reached as high as 24 feet, according to the 2013 State of the Climate report published on Thursday in the Bulletin of the American Meteorological Society. Haiyan killed at least 6,300, with 1,000 more still missing, the report said. Super Typhoon Rammasun makes landfall over Hainan Island in China on July 18, 2014. Credit: NOAA. Tropical cyclones typically weaken after making landfall, as they become cut off from their source of energy. But Rammasun, called Glenda in the Philippines, threw a curveball and initially failed to follow this pattern. “This has been a fairly unique cyclone, most notably since it actually continued to strengthen after first making landfall in the Philippines on Tuesday before later weakening while passing just south of Manila,” said Steven Bowen. “It was rapidly intensifying as it came ashore in the Philippines and for a brief period it was still able to tap into the warm ocean waters to keep fueling itself. Once it moved further over the archipelago, it started to succumb to the frictional effects of land,” Bowen told Climate Central in an email. Though it weakened as it traveled over the archipelago, Rammasun was intact enough that once it emerged into the favorable environment of warm water and low wind shear over the South China Sea, it became reinvigorated. Wind shear, the change of direction and speed of the wind with height, can tear a storm apart. “Despite looking fairly ragged, the storm’s core was able to largely remain intact while crossing the Philippines, which is also why it was able to get its act together again in the South China Sea,” Bowen said. On Thursday, Bowen said that the Joint Typhoon Warning Center (run by the U.S. Navy and Air Force) didn’t expect Rammasun to be much stronger than a high-end Category 3 storm or a weak Category 4. But the storm bucked expectations once again, making landfall with maximum sustained winds estimated at 155 mph, making it at least a strong Category 4 and putting it on the cusp of Category 5 status. Much of that mark has come from the rains Rammasun has poured on the places it has hit. The rains are a particular concern in southern China, where monsoon rains have already caused extensive flooding in recent weeks. “Rammasun could really exacerbate the situation across several provinces in the region,” Bowen said. Global warming is expected toincrease the rainfall from tropical cyclones, “increasing the problem of freshwater flooding from these storms,” Emanuel said. A warmer atmosphere contains more water vapor, which means more rain in storms of many kinds. The next storm in the western Pacific basin, Tropical Storm Matmo, is now gearing up, and could possibly become a typhoon before hitting Taiwan, though its intensity and track are highly uncertain this far in advance.